Cinderella, Sleeping Beauty, Snow White. These popular fairy tales have a history beyond the Disney movies that made them popular world-wide. They have first been published in 1812 as part of a collection known as Grimms’ Fairy Tales. Jacob and Wilhelm Grimm – known as Grimm brothers. It is interesting however that the Grimms wrote the stories down but did not write them as we would understand it today: These fairy tales were part of the local German folklore at the time and thus have been told for generations. The Grimm brothers were interested in language. They worked on grammar, the relationship between languages, old legends and poetry. Putting all this together, they were at the forefront of what today is folklore studies, linguistics and cultural studies but did not exist in the early 19th century. Part of their work was to methodically collect these old folklore tales and writing them down. They were able to publish the collection, which became the essential reference for fairy tales in the German language for the next 200 years. Some of the stories also were transformed into what probably is the most important form for story telling in the 20th century – motion picture – and are today known around the world. Jacob and Wilhelm Grimm have spent their childhood along the Via Regia. They were born in Hanau and grew up there and in the small town of Steinau. Both towns today are proud of “their sons” and the heritage of Grimms’ fairy tales. 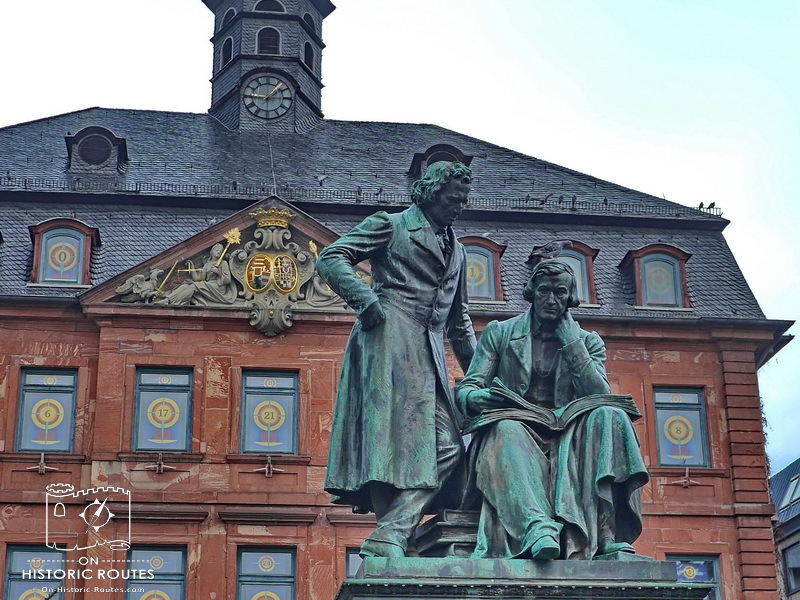 Hanau honors them with a statue in front of the town hall and Steinau hosts a Grimm museum. Furthermore, one of the popular German theme routes, the Fairy Tale Road links both towns and extends further north to Bremen.